Ayurveda classifies seasons as having an affinity to certain doshas. As summer approaches, it is common for Pitta dosha to become imbalanced and cause overheating and inflammatory disorders. Amalaki is a primary herb used to pacify Pitta dosha. There are multiple health benefits of amalaki in Ayurveda. 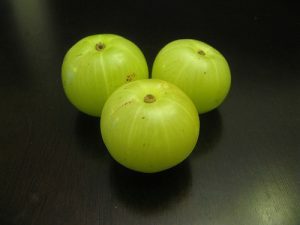 Commonly known in India as amla, its botanical name is Phyllanthus emblica. It is also known as emblic myrobalan or Indian gooseberry. This fruit is one of the three main components of the herb Triphala. It may be used instead of Triphala for individuals who have too much heat in their GI tract. Amalaki has all six tastes (shad rasa) except for salty (lavana). Amla is the Hindi word for sour. As its name implies, amla tastes sour primarily. It is energetically cooling. Its vipak or post digestive effect is sweet. 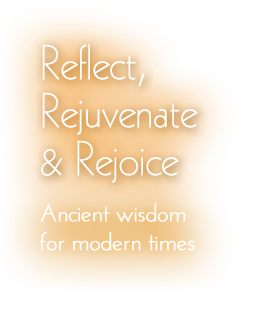 In terms of qualities or gunas, it is light and dry. Amla targets the circulatory and digestive systems. Amalaki works on all seven tissue systems (dhatus) in Ayurveda and is a wonderful reproductive tonic. It reduces fevers, is useful in inflammatory conditions (created by Pitta), and is a blood purifier. 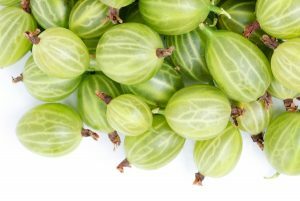 Indian gooseberry is a natural anti-oxidant and it helps to protect the heart. Additionally, amla is useful for heartburn as well as liver and spleen disorders. – It is very rich in Vitamin C, having more than 3,000 mg per fruit. It helps the body absorb calcium. Amla’s high fiber content makes it a natural laxative. – It’s a strong antioxidant that helps prevent damage from free radicals. – Its anti-inflammatory properties helps reduce fevers, strengthen the joints, improve eyesight, regulate blood sugar, and treat urinary tract infections. 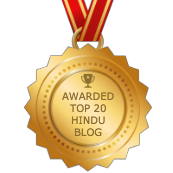 – This herb helps regulate agni (the digestive fire) without aggravating Pitta dosha. It’s a natural antacid. – It helps with debility and weakness, as it boosts the immune system. – This fruit helps reduce physical and mental stress and is helpful for treating insomnia. – It helps make the skin tighter and smoother. Amalaki is also used for sun stroke and sun burns. – It promotes healthy hair, teeth and nails (these are all associated with the bone tissue system or asthi dhatu). Amalaki prevents hair loss, makes hair more lustrous, and can help maintain hair color so that it doesn’t turn gray. Bhumy amalaki is another form of amla which grows on a bush closer to the ground. (Bhumy translates as “earth”). It is a wonderful tonic for both the liver and the gall bladder. Try Amalaki and learn its personal health benefits for yourself. It is available in powder, as well as liquid extract, and tablet form. You can use Amalaki with Yasti Madhu (licorice) and Shatavari for inflammatory conditions, ulcers, and acidity. For diabetes, you may take Amalaki with Acharya and Vairag. Please consult your primary health care provider before changing your health regimen. Amalaki should not be used if you have diarrhea or dysentery, which are Pitta disorders. Use minimally if you have high Kapha. It may not be advisable if you are pregnant or nursing, as it is a natural laxative. A personalized Ayurvedic consultation will help you determine the best herbal and dietary guidance to put you on the road to health and healing.